I started this food blog of mine almost 4 years ago, and in that time I have met some lovely fellow food bloggers. It can be a lonely place blogging especially if you don’t live in a big city. We live in a very small village in the Cambridgeshire countryside. So most of my interaction with other bloggers is online. Sometimes you just connect with someone by reading their blog and by connecting in the comment section. That’s how I met Amanda. Amanda’s blog, My Goodness Kitchen, appealed to me firstly because of her beautiful photos and vegan recipes. Secondly, Amanda’s honesty and openness hit a cord with me, there was a food blogger that sounded a little bit like me! We have been virtual blog friends for the last few years, living on opposite ends of the world. So when I saw a very honest post on Amanda’s blog about chasing her biggest dream, writing a cookbook, I knew how good this book was going to be. Amanda has poured her heart, in the shape of beautiful food, into her first cookbook. Great Vegan Meals for the Carnivorous Family is beautifully photographed and thoughtfully curated. 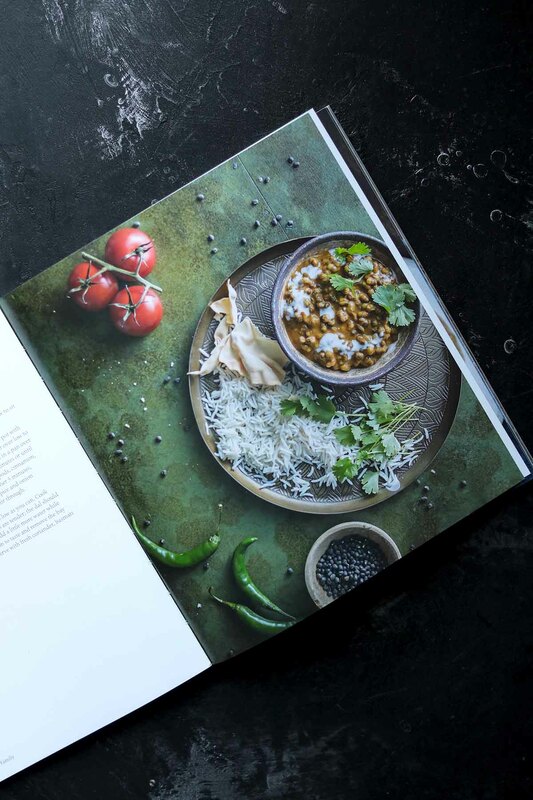 Written for new vegans, the v – curious and everyone in between this book has everything you need to make great vegan food. From breakfast to lunch, dinner and desert Amanda has shared some of her favourite vegan recipes, that also happen to be easy to make. Not only that Amanda has included some awesome basics to up your vegan game, including vegan mayonnaise and coconut bacon. Yes!! Since I received an advance copy before Christmas I have been cooking my way through this book. From fluffy vegan pancakes to smoky jackfruit tacos and vegan vegetable fritters, we have loved every recipe. So I’d like to share Amanda’s vegan vegetable fritters with you today. As a small taste of what you will find in Amanda’s book. To make these vegan vegetable fritters you start with a light batter. Amanda uses chickpea flour, dairy free milk, cumin and smoked paprika to make a lovely light batter. Cauliflower, spinach and peas are added to the batter and mixed so they are covered in the batter. These are drop fritters, so a heaped tablespoon of the batter is carefully dropped into hot oil then cooked for just 2 – 3 minutes each side. Serve them hot with your favourite dipping sauce. And that’s it, easy peasy fritters that taste amazing! We all loved these fritters, they taste amazing and are so light! And they are great for the kids. With those hidden veg that Amanda is an expert on I think these are perfect for fussy little ones. Like all of Amanda’s recipes, these fritters are quick and easy and taste amazing. Combine the flour, baking powder, salt and spices in a large bowl. Whisk in the milk, to make a thick batter. 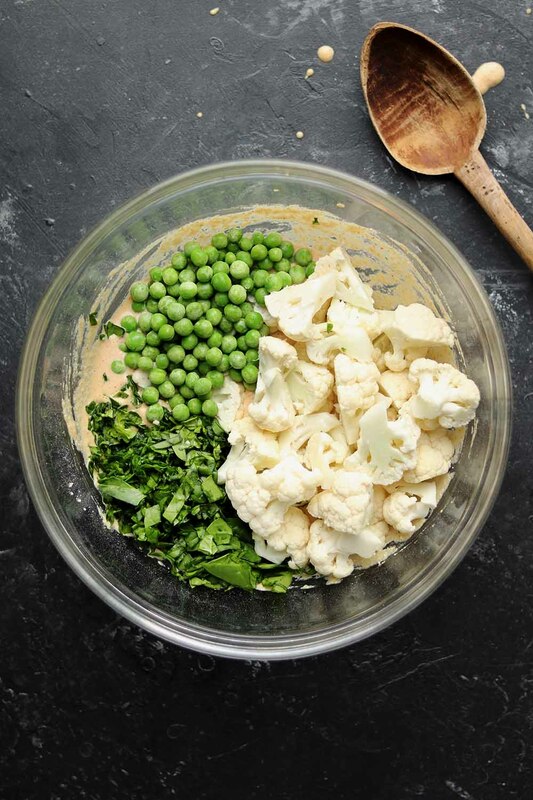 Add the spinach, cauliflower and peas. Stir to coat the veggies. Heat the oil in a large frying pan over medium heat until a drop of batter bubbles when added to the pan. Carefully drop 1 heaping tablespoon (15g) of the fritter mixture into the pan and repeat with another 3 fritters. Don't overcrowd the pan. Fry the fritters on both sides until they are golden and feel firm, around 2 to 3 minutes each side. Serve warm with your favourite vegan dipping sauce. I also used quinoa flour to make these, so if you can't get your hands on chickpea flour then give that a go. This quantity was enough for 4 people as an appetiser or 2 for lunch.